Christmas comes early for bourbon lovers in the fall! This is the time of year when the epic Buffalo Trace Antique Collection (BTAC) drops, when Heaven Hill reveals its successor to the Parker’s Heritage Collection of the previous year, and when Old Forrester blesses us with its birthday bourbon! This year also heralds the arrival of the next episode of Mad Morris’ Master Collection – the Sonoma-Cutrer Pinot Noir Finished Woodford Reserve. You truly never know what you are going to get with the Woodford Reserve Masters Collection. There are pretty big differences between them all. The color is the most noticeable observation one can make without actually tasting it: a deep rusty red. The pinot barrel definitely shows in the color. The nose is another giveaway – far “fruitier” than what most bourbon drinkers are accustomed to. Not sure if there is spice or smoke in there as well, or perhaps a mingling of the two. Some may be put off by the almost potpourri nature of the nose, but I actually appreciate it. Its a welcome change of pace from the honey, oak, vanilla noses that most bourbons possess. All the official tasting notes are usually inaccurate to say the least. 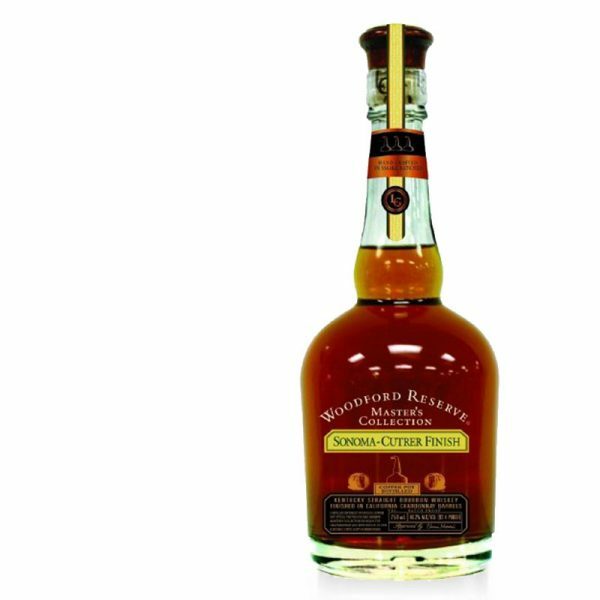 For instance, WoodfordReserve.com describes the Pinot Noir Finished bourbon as ‘Warm and fruit forward with notes of cherry, raspberry, blackberry followed by a crisp spiciness and subtle oak sweetness.’ While I get that on the nose, the taste is anything but ‘subtle’ when it comes to its oak sweetness. Two words come to mind: candy corn. It is also evident that the pinot noir soaked into the bourbon barrels is made in a new world style – despite claiming a Burgundian heritage. The worst style for a pinot. Far too much fruit. Too much alcohol. Too little tannin (which would have been a perfect compliment to the “candy corn”. I enjoy my bourbon. I enjoy my Pinot Noir. I don’t know that i like them together. This combo is a little too soft and sweet for bourbon lovers who dig the burn. The price tag can also be a little off-putting. With that being said, I give this bourbon a C-. How we grade bourbons. Some experiments work, and some don’t. For me, this is a try but NOT a buy. I have bought two (!) $100 bottles from the Master’s Collection and still have them lingering. I would recommend grabbing a pour at your favorite bourbon bar, but that might cost you $25. Have you tried the Woodford Reserve 2014 Master’s Collection Sonoma-Cutrer Pinot Noir Finish? Let us know what you think by leaving your own review below!